I have the pleasure of working with a creative team to create amazing images and events for you all each month.. My team is made up of Stylists, MUAs, Hair, Studio, Lighting, Editors to help make sure your photos are the best they can be from our events.... see below for reviews on our events and teachings..
121 teaching is also available from my home studio based in Bristol..studio set up, model and my teaching per hour. Attended my first group event organised by Kim this week. Really well thought out, excellent models and a lovely buffet. There was a really friendly and creative atmosphere. I hope to go again and continue a creative collaboration with Kim. Highly recommended. Working with Bang Tidy was amazing. Such a creative evening. The home studio is well set up with excellent equipment and a good range of props. The shoot was well organised beforehand discussing the theme and exchanging ideas. On arriva I was well briefed as to the layout of the lighting and the what was expected. Any ideas from me were welcomed and used. I was made to feel very comfortable and it was a privilege to model for Bang Tidy. Can't wait to explore other ideas and work there again. Great creative group shoot organised by Kim. As always she has spent meticulous time planning and testing behind the scenes to ensure smooth running on the evening. Managing to bring together her ideas with great success, mentoring and assisting all evening, Kim has provided another educational fun filled event. I for one have far too many pleasing images on my memory card to know what to do with! Attended another group event organised by Bang Tidy Photography, and to be honest I hardly ever miss them (despite it being a four hour round trip). Kim is one of the few genuinely creative photographers I know, and she somehow manages to come up with a different idea each month. She is always on hand to provide tuition and mentoring, to both models and photographers. The fact that so many people just keep coming back month after month just shows how much we all like working with her. Apart from being friendly, fun events, the quality of the images you leave with is top notch. I achieved my first publication with some shots I took at one of her events, and some of the other photographers who come along have got FPIs with their shots. 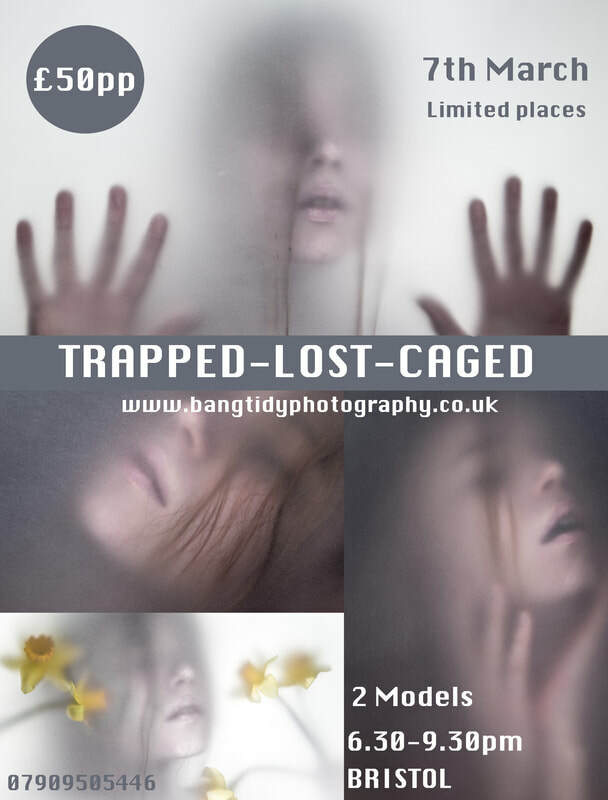 Simply cannot recommend Bang Tidy photography highly enough and look forward to attending many more events. ​An absolute diamond! So delighted to have found this most amazing photographer who is most humble. I didn't really want to write a review as i want to keep her all for ourselves only, but credit where its due, Kim is AMAZING! From her friendly and open way of working to her clever, unusual and unique ideas; Kim has something special and it can be seen in her work. We will most definitely be working with Kim in the future....that's if she can fit us in! Absolutely loved my 121 Lightroom and Photoshop session with Kim this evening. The session was well prepared for with a printed lesson plan and notes ;which you take away with you). Everything well explained, clearly and simply. Plus some wonderful tips and advice about ways to improve, sources, my lens etc. Very happy and would highly recommend! I was so happy when Kim contacted me to be a part of a group shoot at her house, and I was not disappointed! She organised the event really well and the shooting time as shared between myself and another model, with some duo shots. She'd arranged a projector for some awesome backgrounds, and helped direct as well which was really helpful. She's already sent over some really cool images and I'd love to work with her again soon! Highly recommend shooting with her!! I finally had the opportunity to work with Kim and I was delighted with the evening. I had been excited about working with her on some creative projects for a while so when the opportunity rose to come along and bring my stick insects, I jumped! The shoot was fun-filled and I felt relaxed. Watching her tutor was great too, she's helpful, knowledgeable and informative. Her studio evening was incredibly warm and inviting with food and lots of smiles. She booked a skilled makeup artist and some awesome looks were created. I can't wait to see the images created during this collaboration. I recommend working with this awesome photographer queen. Highly recommended, looking forward to booking again. Attended another shoot organised by Bang Tidy Photography today. Everything was organised to the usual high standard, with models, make-up artists and lighting all set up and ready to go. Another creative theme, which delivered some great images. Whether you attend one of Kim's themed shoots, take advantage of 1:1 tuition, or book her as a photographer, I am sure you will be delighted with the results. I attended my second group shoot today organised by Bang Tidy Photography, although I have met Kim before on shoots organised at another studio. Today was typical of the work that she does, in that the organisation was spot-on, the model was top quality, the theme emphasised creativity and she made sure that everyone (photographers, models and make-up artist) felt looked after and appreciated. Apart from coming away with a great set of images, you get on-the-spot coaching so you always learn something. Absolutely cannot fault the day, and look forward to attending more. What an amazing weekend i had with the best people. Kim got in touch regarding a cool shoot idea along with a workshop the following day. How could i refuse!! Ive worked with Kim several times in the past so i knew what to expect but she really pulled out all the stops to make everything a great success which it was! Her port speaks for itself but what it doesnt show you is how beautiful she is inside and out. She and Andy was so accomadating throughout the whole weekend and made me feel so comfortable, so much so that all the free time i had when there i was slobbing about in my pj's!!! Kim has mastered the art from all angles, a former model, a fabulous photographer and a great teacher. She ran the event perfectly which meant all attendees from the day went home very happy people! I cant rate Kim highly enough and i very much look forward to working with her on other occasions. Fantastic group shoot organised by Kim. First rate comms right up to the last minute. She has excellent eye for detail, is very creative, and technically very knowledgeable. Top rated and look forward to the next time. Yesterday we attended Bang Tidy’s Projector event at her home studio in Bristol. We’ve been interested in using a projector in a photoshoot for a while and it was a good chance to try it out without having to buy all the kit. Kim was a friendly and welcoming host and the evening was well organised and interesting. Each of the attendees got plenty of chances to capture images with the excellent model Roughened Rosebud . Bang Tidy had set up the studio and equipment in advance and chosen a variety of images that worked well projected onto the model and showed us the potential of using this tool. We also got the opportunity to project some of our own images, which was fun. We’re very pleased with our images and would thoroughly recommend Bang Tidy events on the basis of this evening. I worked with Kim for the second time at her Projector Night event in her home studio......She was a wonderful host, her pre coms were excellent, when I arrived she was very welcoming with endless coffee and nibbles. The night itself was really well planned, as there was a time frame it was quite fast paced, yet this kept it moving and really interesting. Kim's a very creative photographer, she's down to earth, fun to work with and give excellent direction - basically, she really knows her stuff. 100% recommended and I look forward to working with you in the future.